Home Brazil The Facts Lab Book of Brazil – out now! The Facts Lab Book of Brazil – out now! Our latest eBook for Kindle is another foray into the world of trivia. 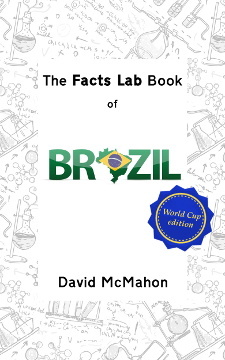 This time British Expat’s own Dave McMahon has been tapping away at his keyboard to create The Facts Lab Book of Brazil: 101 amazing facts about Brazil and the Brazilians . Considering that Brazil’s so big – it ranks at No.5 in the world in terms of both population and area – it’s perhaps a bit surprising that we don’t know more about it. Asked to say what they know about Brazil, most people struggle to get beyond football, coffee, the Amazon and Carnaval. And yet there’s so much more to it than that. Music, dance and culture offer a rich seam of quirky facts. For instance, “The Girl From Ipanema” is reckoned to be the second most covered song in history. But who was that girl? Where is Ipanema? And why did two women fight a copyright lawsuit each about their claim to be identified with the song? The economy and science feature too. Did you know that away from the limelight-hogging trade disputes between the EU and US over subsidies to aviation companies, another one has been quietly bubbling away between Brazil and Canada? Or that the “miracle” açaí berry comes from a palm tree native to Brazil? Or that spams about that berry helped push Brazil to the top of the world’s list of spam source countries in 2007? With the World Cup coming up in June, it’s no surprise that the tournament gets a mention in this book’s pages (this is a special World Cup edition, after all). It looks at both the 1950 World Cup and the 2014 version. You’ll find out why Scotland qualified in 1950 but didn’t play – and why the English will be hoping it won’t be a case of déjà vu all over again in Belo Horizonte. There’s plenty more weird and wonderful stuff to be discovered in this book. Read it, and you’ll never look at Brazil in quite the same way again! You can buy The Facts Lab Book of Brazil through any local version of the Kindle Store. For your convenience, we’ve linked to the .com and .co.uk versions, but there are also Kindle Stores for Germany, France, Italy, Spain, Japan, India, Canada, Mexico, Australia – and Brazil! Then why not try our Quick Quiz about Brazil? We’ve taken five facts in the book and turned them into questions so you can see how much you really know about the country. Go on, it’s fun! This entry was posted	on Thursday 26 December 2013 at 07:51	and is filed under Brazil, Editor's Blog, Expat Destinations. You can follow any responses to this entry through the RSS 2.0 feed. You can leave a response, or trackback from your own site.